Size: 560 sq. m. "or 6027 sq ft floor area"
Lot Size: 500sq. m. n/a "or 5382 sq ft floor area"
This is a beautiful artistic haven. A home you would love to sit around and enjoy the feeling it brings you. The reason behind it could be that the owner is an artistic person who loves to create things that touches your soul. Built 2017. Ownerbuilt. Upon gate entry, the perfect balance between the lap pool, beautiful garden and the 4 level home welcomes you. 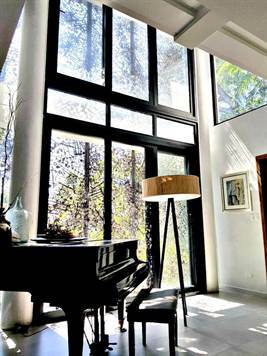 The tall artistic wall sculpture in the piano sitting area adds a soft look to the house. Designed for comfort and practicality, whilst maintaining aesthetic excellence light enters the living room-dining area through high windows. A creative narra staircase gives warmth and beauty to the house. On the second floor are the master suite, family room, 2 bedrooms. Third floor - bedroom that can be converted to office room or entertainment room and view deck with a fantastic view of the buildings of Alabang (beautiful esp. at night) . On the basement are the servant's quarters, service kitchen and utility area. 6 car garage. Other house features: elevator, automatic gate, beautiful landscaped garden. Come and take a look at this beauty - don’t miss out!